Thanks to its geographical position, Peralta is located in a privileged place within the Navarrese Riverside. This region, with a long horticulturist tradition is a crossroad for a great number of rural tourism practisers, apart from being an important economic, cultural and business centre. You can take our hostel as a starting point for day trips or activities aimed for you to discover and enjoy everything Navarre has to offer: nature, art, cuisine, festivals and traditions. If what you like is culture, history and art, do not miss a visit to Tudela, capital city of the Navarrese Riverside. It was founded by the arabs in the 9th century. The cathedral dated from 12th to 18th centuries was built on a ancient mosque. 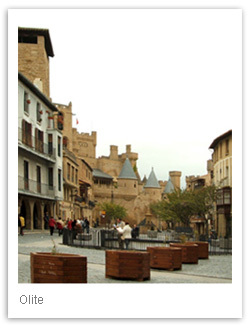 Olite is dominated by its castle-palace which was named a national monument in 1925. This castle served as a royal residence during the Middle Ages and it is the most important example of civil gothic art in Navarre. Pamplona, capital city of the ancient Kingdom of Navarre, plays a leading role during Sanfermines and as a part of St. James' way. And for those who travel with children, enjoy a day in the adventure park Senda Viva. Nevertheless if what you really enjoy is active tourism, do not miss Peñalen ravine, one of the wonders in Navarre, just 2 kms far from the hostel. You can also enjoy the Natural Park of Bardenas Reales, a moonscape reserve in the Navarrese Riverside with fanciful shapes and open spaces to get lost in. If you like, Bardenas can be visited through a guided route in segway discovering the most emblematic places such as Rincn de las Rayas, Castildetierra, Barranco de los Cabrones, Piskerra, etc. Bird lovers can visit an observatory in Laguna de Pitillas, a small lake where the different birds inhabiting the different areas of this Natural Reserve can be seen. Parque Natural de las Bardenas: 25 km.